What does F23 mean on whirlpool washer? It means there is a heater failure. If the water temperature in the washer fails to reach 86 degrees or higher then the washer will give the F23 error code. To fix the whirlpool washer f23 error follow the steps listed below. 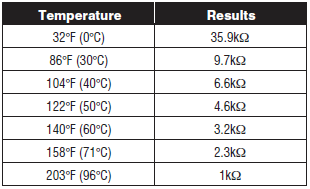 Note: Some models do not have a heater as shown below, some models just have a temperature sensor. If your model does not have a heater just skip to checking the temperature sensor. Check the wiring to the heating element make sure its not burned, broken or corroded. Check the heating element for continuity of course if it does not have continuity then replace the element. Check the water temperature sensor wiring for corrosion or breaks. Remove the wiring harness from the temperature sensor and measure the resistance of the sensor. Refer to the chart below and if its out of range replace the sensor. The replacement part number for the heater is W10426377 and can be ordered from the link below. The replacement part number for the temperature sensor is W10467289 and is available for order below. If you have any questions or need any help with fixing your whirlpool washer F23 error then ask one of our factory trained technicians by clicking the live tech help button at the bottom right of your page. This whirlpool washing machine error f23 repair information applies to all the models listed below in the tags section and many more.